The most practical of campaign utility pouches, for iPad Mini or similar tablet, a glasses/pen side-pocket and a quick-release smartphone pocket to the front. With both a removable, adjustable shoulder strap, and belt loops. 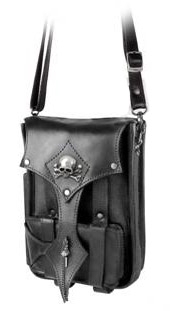 In black leather and canvas with cast skull & bones badge. Approx. dimensions: 25cm (9½") high x 16cm (6¼") wide x 5.5cm (2¼") deep.